For data scientists, predictive analytics is critical – but did you know it can also save lives? Crisis Text Line is using Periscope Data and Python to do just that – improving identification of data trends through natural language processing to better support people in crisis. 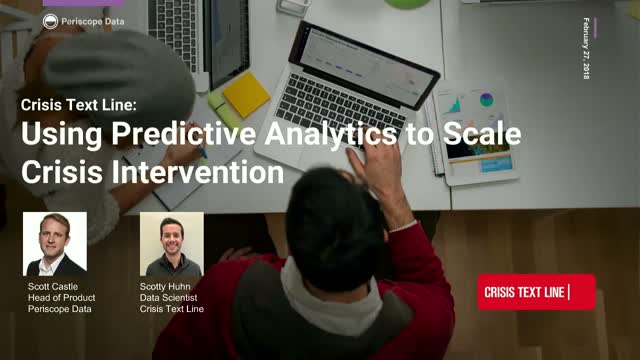 Join Periscope Data and Crisis Text Line Data Scientist, Scotty Huhn, for a webinar to learn more about powering predictive analytics with Python and Periscope Data. We’ll also share how, for the first time, Periscope Data is supporting SQL, Python, and R on one platform, enabling users to do more complex analysis in just a fraction of the time. Building out the infrastructure for a data pipeline takes time, patience, and focus. And even after you have a system in place, new data sources, business goals, product releases, etc. can make it hard to sustain this infrastructure and difficult to spin up new dashboards and charts to visualize and analyze the data. Unless you work at Kongregate. Join our webinar on January 31st at 11 a.m. PT to hear Tammy Levy, VP of Insights and Analytics, discuss how Kongregate is using analytics to not only provide embedded analytics to developers that use their platform, but take it a step further and are able to easily and efficiently measure KPI’s across their portfolio of games they publish. Ever wondered how Periscope Data actually uses Periscope? In this webinar, you'll get a behind the scenes look at the dashboard our executive team uses to report on all our top level KPIs. Combining data from all business units here at Periscope Data, it provides us a concise view of our single source of truth - the one dashboard to rule them all. With the release of our Git integration, teams using Periscope Data will have complete control over their analytics environment. This integration gives data teams a sophisticated version control system, release management workflows and file-level access to all user-generated content. What makes this integration unique is that data teams will be able to sync all user-generated content (including charts, dashboards, views and snippets), as well as edit, create and delete content through Git. It also works with any Git repository that your team uses as part of your workflow, including your own internal Git server. However your team creates, reviews and deploys code, this integration supercharges your analytics workflow. In this webinar, Periscope Data’s senior product manager Mike Kimelblat will discuss the use cases for Periscope's Git integration and explain how data teams can benefit from it.. He’ll even demo how a team can sync and edit Periscope Data’s charts and dashboards from your Git repository. In a more aggressive competitive landscape than ever, data analysis is proving to be the key differentiator between winners and losers. But simply collecting information is not enough to get ahead; companies have to be able to blend data and build effective visualizations in order to optimize their business intelligence. This is part one of a two-part “One Dashboard to Rule Them All” webinar series. Make sure you keep an eye out for the companion webinar, “One Dashboard to Rule Them All: The Business Impact,” presented by Greg Strickland, COO at Periscope Data. Once you’ve done analysis and found insights in your data, determining the right visualization is crucial to telling the right story. Even if you’ve done the work of selecting the right dataset, asking the right initial question, following up with the right additional queries and using your personal expertise to pinpoint valuable information, all of that analytical work loses value if the charting process is not done correctly. Choosing the right chart doesn’t need to be intimidating. Similar to data exploration, you just need to ask a series of straightforward questions. This is the third webinar in our “Citizen Data Science Empowerment” series. The first webinar “Getting Started with Citizen Data Scientists” covered the importance of citizen data scientists, how to get them enabled and how to empower them. The second webinar, “How to Do Data Right,” covered the importance of making sure that you are doing your due diligence when evaluating the data to visualize. For some people, learning a new coding language is easy. For others, the process involves stumbling through a series of individual error messages. When that language has at least 7 major dialects with unique error messaging formats, things get even more confusing. The ability to break down code, understand errors, read documentation and re-write queries are valuable skills all coders and analysts should have. Luckily, there are some tips and tricks to make it easier. To enhance the learning process, Charlotte Campbell, senior customer solutions engineer and resident debugger at Periscope Data, has put together a collection of advice to help first-time coders write SQL that runs smoothly. As companies become more data driven, it’s not enough to deliver the same standard SQL queries. Instead, data teams today are transforming SQL results into models to deliver more value to their businesses. But making that jump is tough, it’s hard to determine where to get started in the complex field of modeling and regression analysis. The Periscope Data community has been buzzing with requests to demystify Python and R modeling so data professionals can boost their skill set. Get started by creating a linear regression model with Neha Kumar, a customer solutions engineer at Periscope Data, and start bringing new analytics value to your business immediately. Marketing is increasingly becoming a data-driven function — tracking more activity than ever before — but how can you make sense of it all? What tools do you need? What roles do the marketer and the analyst or technical partner play? Follow along with Head of Product at Fivetran, and Periscope Data’s Head of Growth Marketing and Head of Sales Engineering to get a full picture of how a data company handles marketing metrics — from the perspective of both the data analyst and the marketing professional. This is the second webinar in our “Citizen Data Science” series. Our first webinar, “Getting Started with Citizen Data Scientists,” covered the importance of citizen data scientists, how to get them enabled and how to empower them. To some citizen data scientists, data is a new language that they’re unfamiliar with translating into insights. For others, they’re eager to dive in and curious to explore, but reluctant to communicate their findings because they don’t have experience translating data into tactical operations. These new business-focused analysts need to be confident that they’re utilizing data properly. To empower these new data dives, Kyle Dempsey, senior professional services engineer at Periscope Data pulled together a collection of tips to make sure first-time analysts are doing data right. You've got a tool (or tools) in place to analyze your product analytics — good work! Once you’ve collected all your pertinent data and established baseline analytics, the next step is to go deeper on your data with advanced analytics. It’s daunting, but the best way to get started is to learn from a company that has already implemented advanced analytics. Join our webinar featuring Oscar Health, a technology-focused health insurance company, to hear them discuss how they use analytics to make a range of business decisions. With Periscope Data, they’ve gained complete visibility into their user journey, tracked how each product contributes to the company’s overall revenue metrics and used advanced analytics to identify complex behavior patterns and predict future usage of their product. All companies have data, and a growing number of these organizations are able to generate insights and business value from it. However, with data expected to double in the next two years, the new limiting factor will be the human capital to find meaningful ways to analyze it. Enter citizen data scientists. With the growth of these data-savvy professionals with domain expertise, not only is there another set of eyes looking at the data, but also the data can be aligned with exactly what insight that professional needs to make a business decision. This new vantage point can help companies make sense of their data in a more effective way than ever, but only if they take the steps to empower these new analysts. There are a few quick tips and process best-practices that need to be considered before they can dive into making sense of the analytics. Sales is a scientific art; it takes someone who can translate their experience as a sales manager into an artful set of best practices. The science part requires the application of advanced data models to standard CRM data to understand their pipeline at greater depth. Blending the quantitative expertise of the data team with the experience, intuition and knowledge of the sales leadership ensures companies are able to use that pipeline analysis to correctly predict revenue. More importantly, that process helps sales managers manage and invest in their team and have data-driven conversations that will lead to exceeding revenue goals. Join Sam Schuster, analytics team lead at Periscope Data, and Ben Loeffler-Little, head of sales at Periscope Data, as they discuss how analytics and sales have partnered to forecast new business revenue and manage pipeline. Together, they have built a tool that models new business revenue and identifies key pipeline trends to ensure sales leadership will hit their goals. The link to SQL for all data models presented in this webinar will be included in the registration follow-up email. All companies strive to drive sales. But acquiring new customers is only part of the battle; the real challenge is retaining them as customers. While net new buyers are great, having a loyal customer base ensures that you have quality product, take a regular pulse of industry needs, and drive pipeline … the goal of most successful companies. Join our webinar with Luma Health, an innovator in the patient experience space, to learn how they leverage their analytics platform to collect insights across the company and how they use those analytics to improve user retention. Product managers often have challenges getting all necessary quantifiable metrics to make informed product decisions. How do you know if you are looking at the right information (and is it all of the information you need)? And now what do you do with this data to ensure that the users experience is the best possible? Join our webinar with Luma Health, an innovator in the Patient Experience space, to learn how they’ve gained full visibility into their user journey and how each product contributes to the company’s overall revenue metrics, ensuring they are fulfilling their customer’s expectations (and innovating new ways to support them). BlueJeans, one of the world’s fastest growing video and web conferencing platforms, has driven incredible growth by knowing exactly what their customers need — the moment they need it. Join Customer Success Pros Jason Graham of BlueJeans and Emilie Davis of Periscope Data for a webinar at 11am PT on April 11 to discuss how to get the right insights from the right place at the right time. You’ll discover how BlueJeans leverages Periscope Data to understand the health of their customers and drive actions that improve overall retention and expansion rates. - Know your data is secure and up-to-date with our best-in-class security and 99.9% uptime. Periscope Data is the most powerful, flexible analytics platform for data professionals and business users. With the fastest time to insight, periscope data helps companies ingest, store, analyze, visualize and report on data — all from a single connected platform. Periscope Data is trusted by more than 1,000 customers, including Adobe, Crunchbase, EY, Flexport and ZipRecruiter.